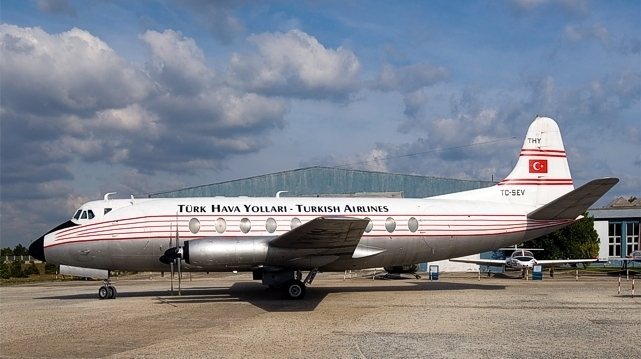 A television documentary about one-time Turkish prime minister Adnan Menderes' life was shot during 2006 and featured Viscount c/n 430 that had been painted up as TC-SEV (c/n 429) in THY - Turk Hava Yollari - Turkish Airlines livery. Prime minister Menderes surived the crash of TC-SEV which happened while the aircraft was on aproach to Gatwick, London, England on 17 February 1959. This Viscount, c/n 430, first flew on 1 September 1958 from Hurn, Bournemouth, Dorset, England and was delivered to THY - Turk Hava Yollari - Turkish Airlines on 19 September 1958. It stayed with Turk Hava Yollari until 3 June 1971 when it was transferred to Turk Hava Kuvvetleri (Turkish Air Force) for VIP duties. Now registered 430 the aircraft frequently visited Aviation Traders Engineering Ltd. at Stansted, England for scheduled maintenance. Withdrawn from use in 1990 430 was preserved at the Havacilik Muzezi on the military side of Yesilkoy airfield, Istanbul Turkey. To help complete the history of the Viscount the Vickers Viscount Network is currently looking for photos of TC-SEV c/n 429. If you can help please contact us at Information@VickersViscount.net.